Every time I go to Olive Garden the Chicken and Gnocchi Soup is my ultimate choice. In fact, I could just order this soup and skip the entree because I think it’s that good! This recipe has all of the familiar flavors of the original recipe and it makes about 6 servings! Using juicy and flavorful rotisserie chicken really makes this soup stand out. A helpful tip I have is to make sure to use a rotisserie chicken that is packed full of flavor and has well-balanced spices. It really makes all the difference in how this soup comes out. Prepping all of these ingredients ahead of time will save time and frustration when making this recipe. The Instant Pot heats up fast on the saute setting so it’s really ideal to have everything ready to go. This recipe uses two settings: Saute and Soup settings. It really is that easy! This recipe takes only about 30 minutes and your family will have an Olive Garden favorite made with love and served at home. 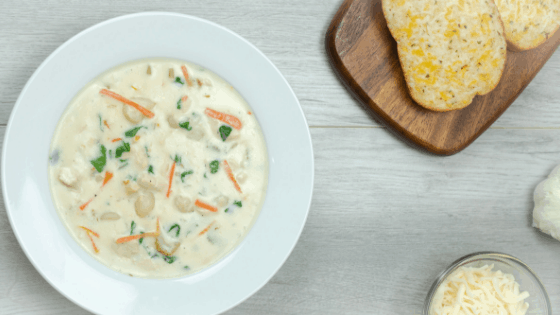 This creamy Chicken and Gnocchi Soup is made using the Instant Pot and is an Olive Garden favorite. Dice, chop, and julienne all ingredients ahead of time. Set Instant Pot on Saute setting and add olive oil and butter. Add in garlic, carrot, onion, and celery. Stir in 4 cups of chicken broth, stirring frequently. Add in rotisserie chicken, thyme, and gnocchi. Flavor mixture with salt and pepper to taste. Set Instant Pot to soup setting and set timer for 15 minutes. Allow Instant pot to naturally release for about 5 minutes and then quick release. Return to Saute and add in Half & Half, spinach, and flour. Saute for about 5 minutes, stirring frequently. Garnish with mozzarella cheese and serve with breadsticks or garlic bread. The rotisserie chicken that you choose with change flavors within this recipe so make sure it's a good quality and flavorful rotisserie chicken that you use! This looks so warm and cozy for this time of year. Love the quick copy cat tips. I haven’t tried this soup as I am a vegetarian, but I love copy cat recipes. Looks pretty easy to make. I love creamy soups like this – and with gnocchi too – I’m sold! So, so good! Ok, you had me at Olive Garden copycat, and I’ve got to try this. Love this recipe and can’t wait to make it. Don’t you just love taking a favorite restaurant dish and trying to recreate it? You did a great job! I have made this recipe twice and my family really enjoys it; however, I keep having an issue with my instant pot showing a burn message. You may need to add more liquid to prevent the error from coming up. Hope that helps! I’m happy to hear your family enjoys it! Does it matter what type of onion you use? White? Yellow? If I dont use rotessiere chicken, does my chicken have to be pre cooked?